DWYFACH Criccieth, self catering cottages with instant confirmed online booking. We have Self Catering throughout Gwynedd , Wales . Accommodation near all the attractions, places to see and things to do.......You are able to make an instant secure confirmed online booking. We also offer Gwynedd AND Wales travel and tourist information..
A good rural location, a mile from beaches and town centre, great for discovering castles, steam railways and the Lleyn Peninsula.. Originally the saw mills of a large North Wales estate, this pleasant, converted holiday cottage constructed of stone under a slate roof with courtyard frontage, is set in a rural area near to the owners&rsquo; working farmyard. Conveniently located less than a mile from Criccieth town centre and the beaches that surround it, the property offers good quality affordable accommodation. Criccieth itself boasts some top quality restaurants, a 13th-century castle ruin and golf course. Other popular tourist attractions on the Lleyn Peninsula include the Ffestiniog railway, Abersoch watersports centre and the world famous Portmeirion. 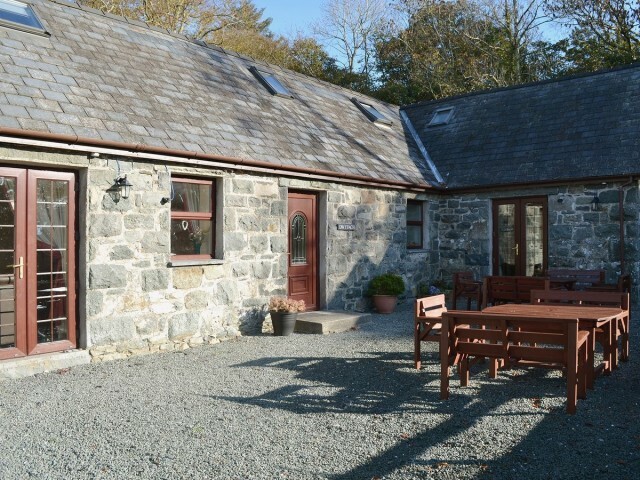 Within easy driving distance are the attractions of Snowdonia and Caernarfon. There is a rabbit farm and the burial place of Lloyd George in the nearby village of LLanystumdwy. Locally, there is fly and coarse fishing, horse riding, golf, ten pin bowling and go karts. Shops and pubs 3/4 mile. Please note maximum of 5 guests.. Ground floor: Living room with patio doors. Dining room/kitchen. 2 bedrooms: 1 double, 1 twin. First floor: 1 double bedroom with sloping ceiling. Bathroom with shower over bath and toilet. Maximum 5 guests.. Gas central heating included (&pound;25per week, &pound;15 per short break November-March). Electricity, bed linen and towels included. Cot. High chair. DVD. Gas hob. Electric oven. Microwave. Washer/dryer. Dishwasher. Fridge/freezer. Shared patio and furniture. Ample parking. No smoking. Originally the saw mills of a large North Wales estate, this pleasant, converted holiday cottage constructed of stone under a slate roof with courtyard frontage, is set in a rural area near to the owners’ working farmyard. Conveniently located less than a mile from Criccieth town centre and the beaches that surround it, the property offers good quality affordable accommodation. Criccieth itself boasts some top quality restaurants, a 13th-century castle ruin and golf course. Other popular tourist attractions on the Lleyn Peninsula include the Ffestiniog railway, Abersoch watersports centre and the world famous Portmeirion. Within easy driving distance are the attractions of Snowdonia and Caernarfon. There is a rabbit farm and the burial place of Lloyd George in the nearby village of LLanystumdwy. Locally, there is fly and coarse fishing, horse riding, golf, ten pin bowling and go karts. Shops and pubs 3/4 mile. Please note maximum of 5 guests.